1. W-2 from a job that you quit in the previous year but still got paid in the current year. Or a W-2 for a job you worked for a very short period of time. A W-2 should be issued no matter how small of an amount you earned. 2. 1099-SA for health savings account distributions. While most HSAs only allow you to take out proceeds for medical expenses we still have to report this on the tax return. If we do not report the distribution and report how much was used for qualified medical expenses you will get a notice that all distributions are taxable. 3. Form 1098 for mortgage interest in a year you refinanced your home loan. If you refinanced during the year you will have 2 (sometimes 3) mortgage statements. Depending on how you refinanced sometimes your loan is sold to another lender, so you will have your original loan, the company you refinanced with, and the final company that holds your mortgage. 4. 1098-E for student loan interest. If you made under $80,000 (or $160,000 jointly) you can deduct up to $2500 in student loan interest so don't forgot to look up the amount. 5. 1098-T for tuition for you or your dependent. Many times people don't pay for schooling for their children (they are using loans) and thus they don't believe they are allowed any kind of credit. That is not true. You can not take a credit for school paid for with scholarship or grant money but if it is paid for out of pocket (by you or your dependent) or with loans you may be able to claim these education expenses. 6. Child care expenses are also deductible. Even if you have a plan at work that reimburses you for these expenses we still need to provide this information on the tax return. We need the Name, SSN/EIN, and address for your child care provider. We also need the amount you paid for services. If you use an individual you may have to request this information by giving them a W-10. 7. New child information. If you had a new baby during the year we will need legal name, date of birth, and social security number to add the child to the return. Most people don't know their child's social security number off the top of their head so make sure to look it up before getting ready to do your return. Likewise, if you have a parent or other family member that is now living in your home and you will be able to claim him/her as a dependent you will need the same information for that person in order to claim their exemption. 9. Charitable Donations are frequently left off because people think there is a minimum they need before it's deductible. Any donation can be added if you itemize deductions. If you donated clothes or household items (non-cash) then we need to know a value and date of donations. You may not have made the donation for the tax break, but if you're allowed to take it you should save yourself a little bit of money by deducting it. 10. Bank Information! If you get a refund the quickest way to get your refund is by direct deposit. So make sure you have your routing number and account number handy. One of the big losses for employees with the new tax law is that they are no longer able to deduct "unreimbursed employee expenses." For those that have employers who pay for all expenses this may not be a big deal. However there are several industries this will impact. Many times employers do not reimburse for mileage, this is no longer deductible. If you have to pay for your own licensing or equipment you can no longer deduct it. Union dues are also no longer deductible. If you have your own travel expenses or education expense for your job you can no longer deduct it. (Do you see the pattern?) Or maybe you work from home--no longer deductible. While this deduction was previously subject to a 2% AGI limitation it's now no longer allowed at all. Also if you went from one job to the other, in the past, you were allowed to take mileage between jobs--this is no longer allowed. These expenses can vary even by field. However, many sales people have lots of unreimbursed expenses that will now not be allowed. Also a lot of construction workers have expenses from travel to tools that will also not be allowed going further. One small win is that educators will still be allowed the front page deduction for up to $250 (which most people know is hardly anything). If you fall into this category you may want to talk to your employer to see if there are other options for 2018. The first option would be for your employer to reimburse you for these expenses if they are necessary to do your job. Of course that always would have been a great options. However, many businesses got fairly sizable tax cuts (if they are corporations) so perhaps they will be more willing to help their employees. If an employer reimburses you under an accountable plan then it is not reported on the W-2 as additional income. If you fall into certain fields you may want to discuss being a statutory employee with your employer. The IRS provides the following guidelines for being a statutory employee (https://www.irs.gov/businesses/small-businesses-self-employed/statutory-employees) If you are a statutory employee you fall in sort of a middle ground between contractor and employee. Your income and expenses are reported on a Schedule C. So you would be allowed to deduct these expenses. Maybe it's time to venture out on your own and start your own business. If you are a contractor (not an employee) you would file a Schedule C and be able to deduct work related expenses. The down side to being a contractor is that you will not have any benefits from the company you are working for. You would also have to pay for your own social security and medicare expenses. There are definitions of employee vs contractor, so it's possible that you could not be classified as a contractor. However if you've ever thought about doing things on your own this may be the time to explore that option. One thing is certain, if you have previously taken employee expenses and have your exemptions set to take out less taxes because of this then you will want to adjust your W-4. If you don't adjust your withholding you will end up owing more money at the end of the year. Kansas does not allow employee deductions, so it will not impact your Kansas filing even if you've been taking those expenses in the past. Missouri currently starts with the Federal itemized deductions, so if you have had these expenses in the past they have benefited you and you will now lose those deductions. So again you may need to change your withholding allowances to make sure you will be taking enough taxes out. New withholding tables have been released so that employers can change your withholding (they are required to do it by February 15th, so if today is pay day don’t think you’ll see it today). 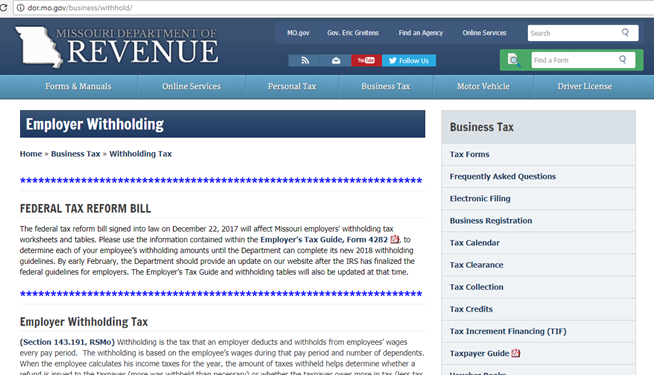 Here are some FAQs from the IRS (https://www.irs.gov/newsroom/irs-withholding-tables-frequently-asked-questions​). I will caution...this says you don’t need to do anything. However I would disagree. While the majority of people may not need to adjust their withhold I would say those with children over 16 will want to check their withholding. Also those that have previously taken extra exemptions because they itemize may also want to change their exemptions. Aimee Sanita is the owner of Circle Tax & has been doing taxes for over 20 years. "Circle Tax and Accounting is the best!"